Books by Castle Rock Writers! Castle Rock Writers is a Colorado nonprofit corporation whose vision is to provide education and support for published and unpublished writers through affordable conferences and workshops, including outreach to young adult writers. The groups has published three books on regional history. Embrace Douglas County’s rich heritage! Castle Rock Writers bring readers a collection of vintage images and sketches of Douglas County from approximately 1861 to 1950—covering the settling of this part of the West to the post-World War II years. Early homesteaders, adventurers, and prospectors journeyed west following the 900 plus miles along the Cherokee Trail, seeking the wealth of gold or needing the curative air of Colorado. On the long and arduous trip, travelers stopped at the Twenty Mile House in Parker or the Pretty Woman Ranch on the First Territorial Road. They needed to clean off the dust and dirt and enjoy a nourishing meal before the final push to Denver and beyond. Some simply stayed. They homesteaded ranches, staked out mines, and built small towns on the rolling plains, mesas, forested hills, or in the mountains of Douglas County’s eventual 843 square miles. In the first half of the 20th century, the region grew into cohesive communities, where families thrived through ingenuity and hard work. Neighbors supported neighbors. “Western Region and Platte River: Rugged and Beautiful,” by Laura Smallegan Adema. It’s hard to imagine that Douglas County’s breathtaking vistas—now occupied by expanding suburbs and quiet, open spaces—were once the home to dinosaur herds and, later on, nomadic Indian tribes. The nation’s second gold rush brought those seeking great fortunes to central Colorado, but it was the untapped potential of the area and a dream of taming the land that appealed most to early settlers of Douglas County. Pioneers like General Bela Hughes and John D. Perry (whose agreement led to the railroad connection across Kansas to Denver) and Martin Henry Goddard (who, along with his wife, Nellie, ran the Rhode Island Hotel) were among the first of many settlers to establish roots here. Join the Castle Rock Writers for a journey through the history of this land and the diverse legacy left behind by those who made it their home. The contributing authors are Jean Jacobsen, Alice Aldridge-Dennis, Tania Urenda, Susan Rocco-McKeel, Mark A. Cohen, John Longman, Derald Hoffman, and Kimberlee Gard. The book is available for $20. 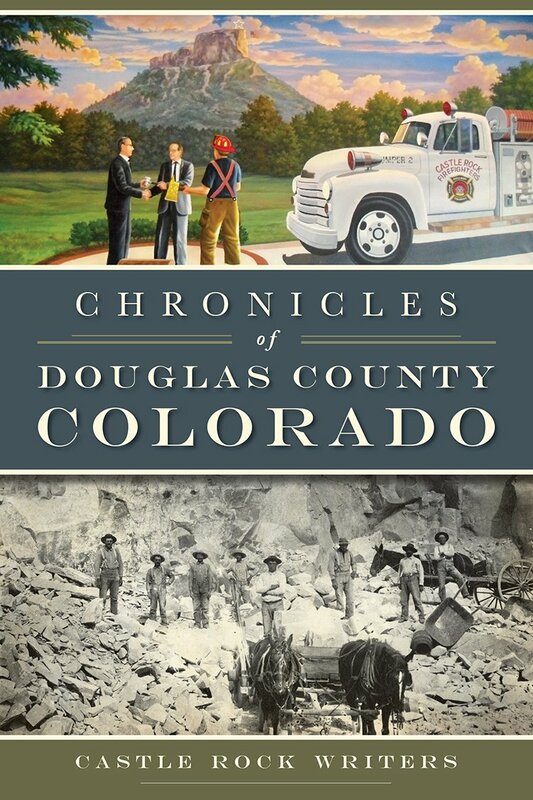 In 2005, Castle Rock Writers published Douglas County, Colorado: A Photographic Journey through the Douglas County Libraries Foundation, covering the years from the 1800s through 1950. The authors were Laura Adema, Alice Aldridge-Dennis, Derald E. Hoffman, Susan Koller, Kathleen Stevens McCoy, Marjorie Meyerle, Susan Trumble, and Elizabeth Wallace. Elizabeth Wallace was the founding leader of the original Castle Rock Writers (1999), and she served as the project manager of the publication. In 2012, CRW incorporated and became a non-profit 501(c)3 organization.